Download "BRIGHAM AND WOMEN S HOSPITAL"
2 a. Application or resume submitted to Human Resources b. Verification of licensure must be completed by the Recruiter prior to hire (via primary source verification), and placed in the official employment record 1. c. Each employee must undergo a criminal background check and any additional check as required. NOTE: Outlined above are the minimum requirements for every position; some positions may have additional requirements. BWH reserves the right to rescind an offer, or to terminate employment, if information is misrepresented, or omitted from an application or resume, or during the interview process. 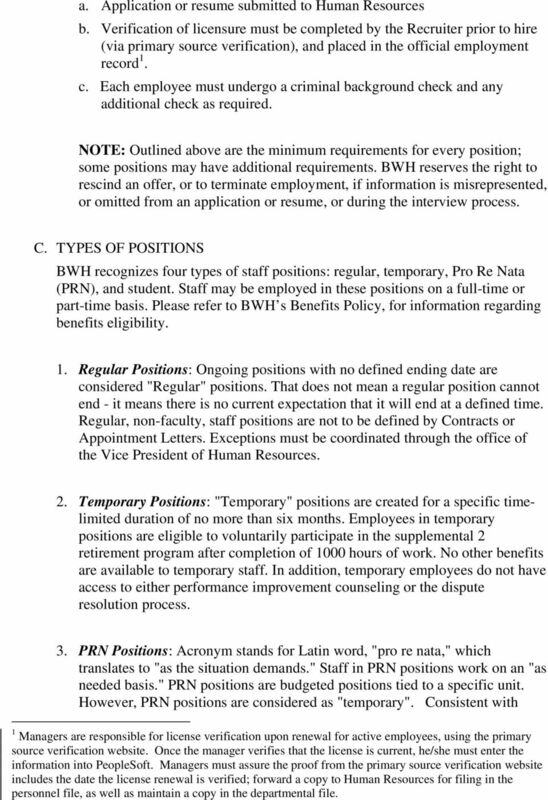 C. TYPES OF POSITIONS BWH recognizes four types of staff positions: regular, temporary, Pro Re Nata (PRN), and student. Staff may be employed in these positions on a full-time or part-time basis. Please refer to BWH s Benefits Policy, for information regarding benefits eligibility. 1. Regular Positions: Ongoing positions with no defined ending date are considered "Regular" positions. That does not mean a regular position cannot end - it means there is no current expectation that it will end at a defined time. Regular, non-faculty, staff positions are not to be defined by Contracts or Appointment Letters. Exceptions must be coordinated through the office of the Vice President of Human Resources. 2. Temporary Positions: "Temporary" positions are created for a specific timelimited duration of no more than six months. Employees in temporary positions are eligible to voluntarily participate in the supplemental 2 retirement program after completion of 1000 hours of work. No other benefits are available to temporary staff. In addition, temporary employees do not have access to either performance improvement counseling or the dispute resolution process. 3. PRN Positions: Acronym stands for Latin word, "pro re nata," which translates to "as the situation demands." Staff in PRN positions work on an "as needed basis." PRN positions are budgeted positions tied to a specific unit. However, PRN positions are considered as "temporary". Consistent with 1 Managers are responsible for license verification upon renewal for active employees, using the primary source verification website. Once the manager verifies that the license is current, he/she must enter the information into PeopleSoft. Managers must assure the proof from the primary source verification website includes the date the license renewal is verified; forward a copy to Human Resources for filing in the personnel file, as well as maintain a copy in the departmental file. 3 other temporary positions, employees in PRN positions are eligible to voluntarily participate in the supplemental retirement program after completion of 1000 hours of work, and are viewed in the same way as other temporary employees. No other benefits are available to PRN staff. In addition, a PRN employee does not have access to either performance improvement counseling or the dispute resolution process. 4. Student Positions: Supervisors should be aware of the special issues related to student employment, including limits on the number of hours students may be authorized to work. There are additional restrictions if the student is a minor. Please contact your Recruiter to determine if an individual can be hired into this category D. RECRUITMENT GUIDELINES Outlined below are key points for the applicant in the hiring process, as well as key points for the hiring official. A. Applicant Process 1. Application forms or resumes are considered "active" for six months 2. Applications for specific positions will be accepted during the period specified as the apply by date on the BWH job posting website. B. 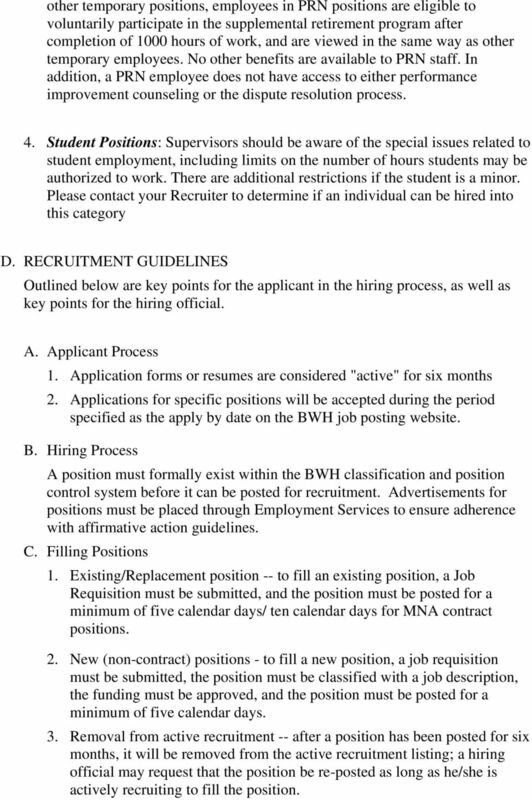 Hiring Process A position must formally exist within the BWH classification and position control system before it can be posted for recruitment. Advertisements for positions must be placed through Employment Services to ensure adherence with affirmative action guidelines. C. Filling Positions 1. Existing/Replacement position -- to fill an existing position, a Job Requisition must be submitted, and the position must be posted for a minimum of five calendar days/ ten calendar days for MNA contract positions. 2. New (non-contract) positions - to fill a new position, a job requisition must be submitted, the position must be classified with a job description, the funding must be approved, and the position must be posted for a minimum of five calendar days. 3. Removal from active recruitment -- after a position has been posted for six months, it will be removed from the active recruitment listing; a hiring official may request that the position be re-posted as long as he/she is actively recruiting to fill the position. 4 D. Employment Services 1. Responsibility of Recruiter -- for all positions, Recruiters are accountable for sourcing and presenting a diverse pool of candidates, as well as notifying the hiring official when a position has an affirmative action hiring goal. 2. Search firms or consultants selection of search firms or consultants are coordinated through the director of Employment Services. 3. Affirmative action monitoring for internal reports and federal audit purposes, Employment Services tracks all BWH staff hiring activity. 4. References When references are required, a minimum of two should be obtained from an applicant s previous employment. Prior Performance Reviews may be substituted for a reference from an external candidate. When the applicant has no previous employment, other references may be considered. Either the Recruiter or the hiring official may check references. 5. Salary recommendations salary recommendations are coordinated with the appropriate Recruiter prior to extending an offer. 6. Written offer of employment Recruiters are responsible for confirming any offer of employment in writing and ensuring that the offer letter includes appropriate language. E. Hiring Official 1. Coordination with recruitment all hiring officials must submit any resumes (solicited or unsolicited) or applications to Employment Services to ensure that the application is tracked in the Applicant Tracking System (ATS). 2. Responsibility of hiring official -- hiring officials are accountable for consideration of all candidates and for interviewing a diverse pool of candidates that is sufficient in scope so that the most qualified applicants are given due consideration. Interview notes and documentation on applicants are subject to audit, and should be kept on file in the department for two years from the date of hire. 3. 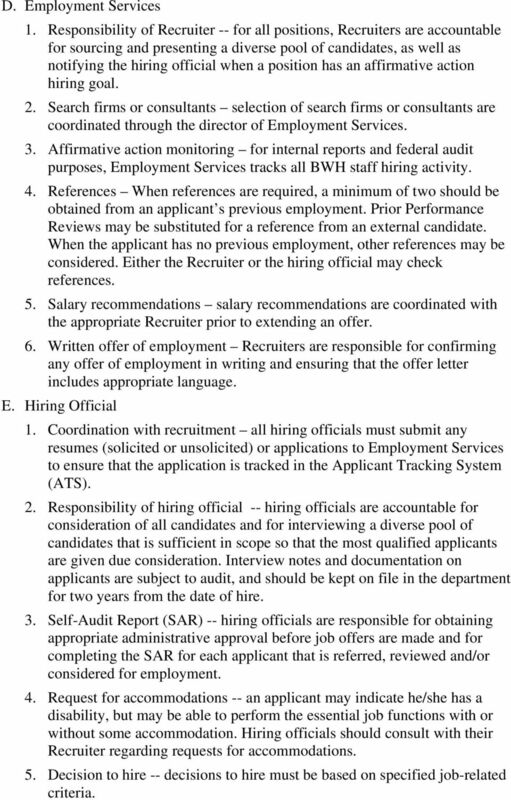 Self-Audit Report (SAR) -- hiring officials are responsible for obtaining appropriate administrative approval before job offers are made and for completing the SAR for each applicant that is referred, reviewed and/or considered for employment. 4. Request for accommodations -- an applicant may indicate he/she has a disability, but may be able to perform the essential job functions with or without some accommodation. Hiring officials should consult with their Recruiter regarding requests for accommodations. 5. Decision to hire -- decisions to hire must be based on specified job-related criteria. 5 6. Offer of employment -- hiring officials can only extend a verbal offer of employment. However, written confirmations of offers must be coordinated with the appropriate Recruiter. Offers of staff employment are not contracts for guaranteed employment for a specific term; and as such, BWH employees are employees at will. E. GENERAL INFORMATION A. Minors: Federal and state laws restrict the nature and amount of work that people under the age of 18 can perform. Contact Employment Services to ensure compliance with child labor laws when considering hiring a minor. B. Non-Resident Aliens: Individuals who hold citizenship in countries other than the United States are subject to special conditions related to employment. Eligibility to work in the U.S. depends on an individual's visa status. Hiring officials who are considering employing a foreign national must coordinate with their recruiter and the Partners Office of International Staff, Scholars and Students to make sure that all legal and policy requirements are met before any job offer is made. All employment actions will be conducted in complete accordance with the Equal Employment/Affirmation Action policy for BWH. 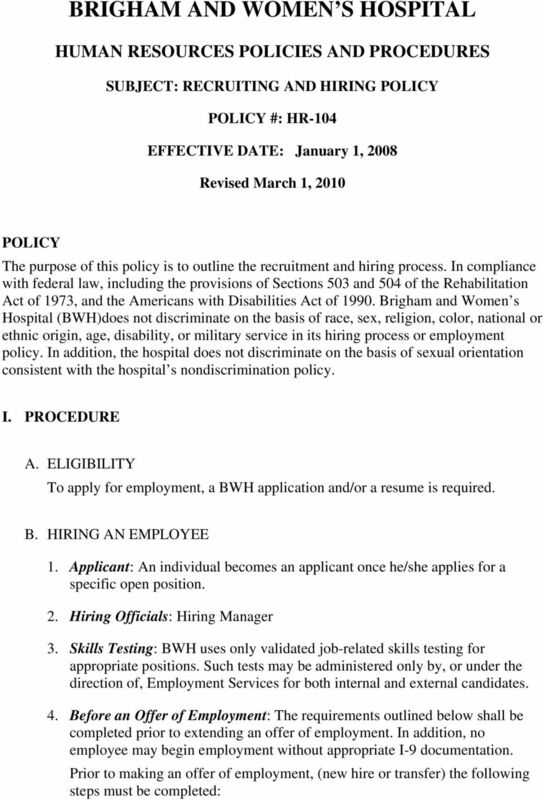 (See BWH HR Policy # 101) APPROVED BY: Vice President Human Resources Chief Operating Officer This policy is intended as a guideline to assist in the consistent application of Brigham and Women s Hospital policies and programs for employees. The policy does not create a contract implied or expressed, with any hospital employees who are employees at will. The hospital reserves the right to modify this policy in whole or in part, at any time, at its sole discretion. Purpose To assist Rensselaer leadership with managing and developing its human capital. 1. University President s Reaffirmation of Commitment to Equal Employment Opportunity, Access, and Affirmative Action 2. Search Committee Orientation Human Resources 3. Compliance Office Guidepoints 4. YMCA OF CENTRAL OHIO APPLICATION FOR EMPLOYMENT EVENING PHONE. OTHER NAMES USED DURING PRIOR EMPLOYMENT Maiden name, other surname, etc. TABLE OF CONTENTS A. Equal Employment Opportunity Policy 41 C.F.R. 60-741.44(a), -250.1 3 B. Review of Personnel Processes 41 C.F.R. 60-741.44(b);-250.6(b). 4 C. Physical and Mental Qualifications 41 C.F.R. THE HUDSON COUNTY IMPROVEMENT AUTHORITY AFFIRMATIVE ACTION COMPLIANCE/MANDATORY EEO LANGUAGE N.J.S.A.